Michael Shenton offloads under pressure in Castleford Tigers' most recent game with St Helens. The Betfred Super League fixtures for 2018 have been released today with each of the 12 top flight clubs discovering who they will face at key points throughout the season. The season will kick-off on Thursday February 1 when the Betfred Super League Champions Leeds Rhinos take on Warrington Wolves at The Halliwell Jones Stadium. The 2017 Grand Final winners will be hoping to start the defence of their title with an away win, while new Warrington Wolves Head Coach Steve Price will be eager to impress the home crowd when taking charge of his first ever Super League game. The 2017 League Leaders’ Shield Winners Castleford Tigers will open their 2018 campaign when they travel to face St Helens at the Totally Wicked Stadium on Friday February 2, with St Helens out for revenge for the thrilling golden point win Castleford secured in the 2017 semi-final, one of the games of the season. Both games will be shown live on Sky Sports, who will once again be broadcasting nearly 100 games throughout the 2018 Rugby League season. The Grand Final replay will have to wait until round seven when Cas will head to Elland Road on March 23 to play Leeds Rhinos. Easter weekend will see Daryl Powell’s men head to Wakefield Trinity on Thursday, March 29 before they host Warrington Wolves Jungle on Monday, April 2. 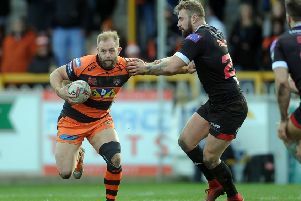 To end the regular season, Castleford face Huddersfield Giants at home before their final regular season game against Widnes at the Halton Stadium.